You might've seen Omit's recent Texas Round-Up tour flyer with the words, "And introducing new pro…" scrawled across the bottom, and scratched your heads in bewilderment, wondering who the hell it might be. Well here’s a hint/answer/bet you lost with your homey: It’s Peter Ramondetta. Chris Cole, Jimmy Carlin, and now Peter Ramondetta—goddamn, that's a heavily stacked pro team for a less than one-year-old clothing company if we've ever seen one. 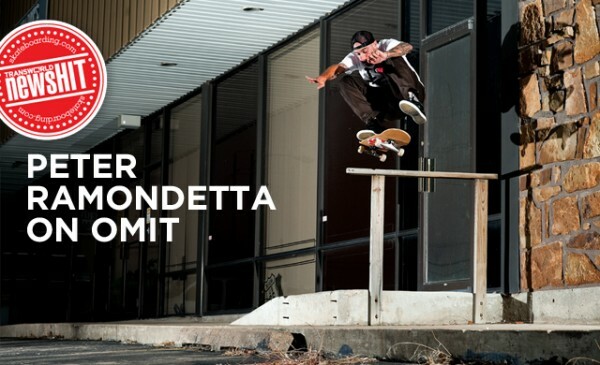 As Omit Apparel continues to grow out of its infancy stage, Ramondetta hopped on the phone from his hotel room in Houston—two days before a three-stop mini tour in Texas—to discuss his new clothing sponsor, and what it's like to have Chris Cole personally handpick him to represent Omit. So there's this Omit flyer online announcing a Texas tour and a new pro on the roster. I take it that's you, yeah? Yeah, I guess so [laughs]. Where's the connection for Omit come from? You don't really share any of the same major sponsors as Chris Cole. I mean, I guess you're on Monster and you do Street League, but it still comes as a bit of a surprise. Well I always see him around at events all the time, and we've always gotten along. So I think when he was starting this up, he just threw it out to Ken [Lewis], and Ken called me up. I was down to do it. It sounded like a good thing, and I didn't really have anything else going. So I'm down to be a part of it. So it was pretty much out of the blue? Yeah, It kinda came out of nowhere for me. I didn't really see it coming. I'm still trying to let it settle in my head. But the clothes are good and I'm stoked on all the gear. I'm sure this trip will go well. I'm looking forward to skating with everyone and jumping right in. Yeah. It's kinda crazy having Cole personally handpick you, out of anyone he could choose. Yeah. It seems super random. I mean, it was left field for me. When I first heard of it, I was just like, "Really? All right" [laughs]. But I'm stoked that he even thought of me or had me in mind. Definitely. The team seems like it's comin' together pretty well. Who do you think, besides Cole, is the gnarliest guy on the team? Well I was pretty stoked on that new guy Kyle [Frederick]'s part. I haven't met him yet, but I just saw his introduction part. It seems like he's got a rad steez. I think I'm gonna finally meet all those guys tonight or tomorrow, whenever they get in. I think this is going to be my introduction to everyone. Kyle Frederick’s intro to Omit video’s pretty, prett-ay gnarly, and apparently Ramondetta thinks so too. What's the deal behind this Texas trip you guys are about to go on? It's a little demo trip, or a filming trip, or what? Yeah, I think it's pretty short. Just two or three demos, and then try to skate in between if we get chances. So, yeah I'm sure we're gonna hit up street stuff. So based on your parts that have come out, you're obviously down for Judas Priest and other metal bands. How do you feel about Cole's passion for Children Of Bodom? You down with them too? Well, I don't know. I haven't really heard too much of them. I think I maybe heard one or two songs. That wasn't a requirement to get on? You didn't have to be down for the Bodom? No, he didn't say I had to be down for them for it [laughs]. Moving forward with Omit, are you going to be having any signature clothing or anything like that? Yeah, they were talking about it when we were talking about the whole deal, or whatever, so I think eventually we're going to get something goin'. I'll come up with some ideas for some stuff. What's one type of clothing product you'd really be down to make? A nice jacket. Not too heavy, like a nice windbreaker style jacket—a jacket that's good for the city. That'd be a good one. What's the best thing about having Chris Cole as a boss now? Well, you don't really have to worry about demos too much. He's always gonna come through pretty good [laughs]. But I don't know. I'm still kinda fresh to the whole thing. I'm still waiting to see how it's gonna go. Well, I hope not [laughs]. Well, you can't beat your boss. You have to intentionally let your boss do better than you at any job you ever have. Yeah exactly. But I don't think I'd be beating that guy anyways, so I don't have to stress too much about it [laughs]. What are the plans for the immediate future? Are you guys going to be working on a video or anything? For the Omit stuff I haven't really heard any plans for the video. But I'm sure I have to put together one of those quick introduction videos that everyone else had on the site. But other than that, I don't know. I'll be filming for some C1RCA stuff. I know they want to do a video.